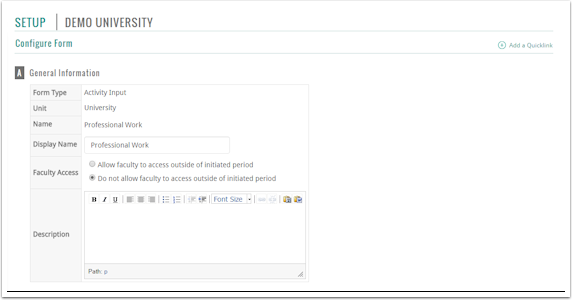 The Activity Input Form contains data about faculty members that tends to change over time, such as during academic terms. Consistent with the Interfolio top-down implementation approach, customization should be performed at the highest level (e.g., university) and then at the next lower level (e.g., colleges), and so on. The data that is collected creates the basis for reporting and other output (e.g., CVs, institutional reports, accreditation reports, etc.). In the Configuration section, click Activity Input Form. The Activity Input Form - Count By Unit screen displays. If you choose to create a new activity input form, the Add Configuration pop-up displays. You are instructed to select the desired unit and a template for the new activity input form. Click Add. The Add – Method pop-up displays. Choose a method. You have the option of modifying an existing activity input form or adding a new activity input form for users assigned to the selected unit. 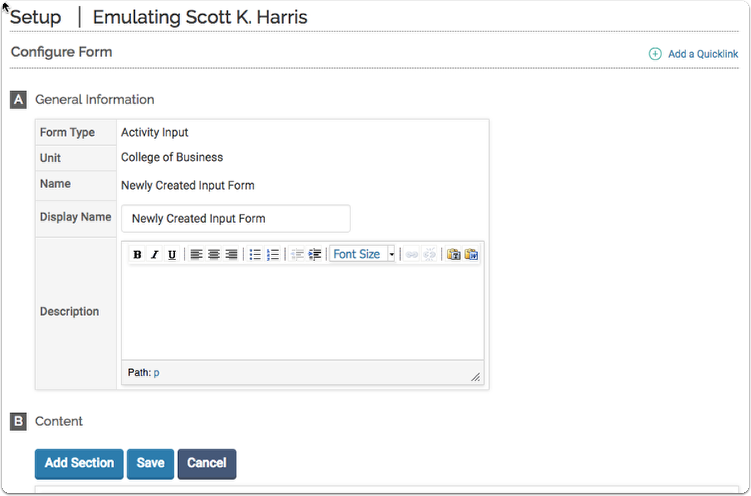 If you choose to add a new form, you will be prompted to create a name for the new form in the Input Form Label field. Click Okay. The Configure Form screen for the activity input form displays. In the General Information section, select the appropriate faculty access for the form. Type a description of the new form, if desired. In the Content section, select which sections should be shown and hidden on the activity input form, and specify the order of the sections. Custom sections can be created by clicking Add Section. (See Custom Input Sections for more information.) If a custom section is created, the new custom section will be available in all activity input forms that exist at the same unit level. The new custom section will automatically display in the new activity input form; however, it is set to Do Not Show in the other activity input forms at the same unit level. By default, the sections shown in the Activities screen for faculty members is based on the default activity input form that is selected. To configure individual sections in the Activity Input Form, click the Edit icon adjacent to the desired section to be configured. When you are finished, click Save. To change the order of the sections or hide a section, click the Reorder drop-down. Your Institutional Implementation Team will work with your Interfolio Project Manager to configure the components of the Activity Input Form. Your institution can determine which teaching fields can be edited. * Courses Taught are administratively uploaded. Data is transferred from institutional ERP systems. Click the Admin menu, then click Setup. Click Activity Input Form in the Configuration section. Select the Activity Input Form to be edited. Click the Edit icon adjacent to the desired form. Click the Edit icon adjacent to the Teaching section. See Set Up Foundational Areas for more infomation. · A Controlled list can be added at each unit level. List will change based on the unit selected. If no Controlled list is available for a unit, there will be an open text box. See Set Up Foundational Areas for more information. After an institution has created a template, a lower unit may have the ability to make a copy of it to edit and configure to fit it's needs. Select the relevant unit where you would like to add the new form. Click Add, to add a new form. 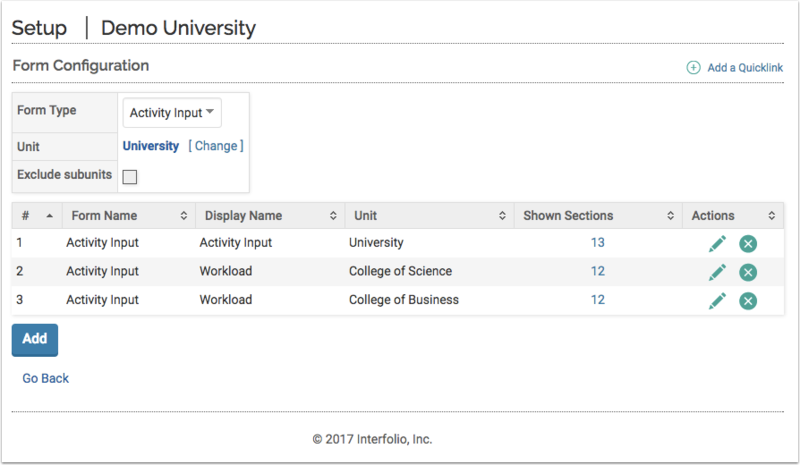 Select to either Modify the existing Workload for users primarily assigned within the College of Business, OR choose to add a new input form by cloning the current workload form for the College of Business. Make any relevant changes to the newly cloned form, and then save when finished.